Justin Trudeau took on a more swashbuckling image Halloween night as he took his family out trick-or-treating. Justin Trudeau took on a more swashbuckling image Halloween night as he took his family out trick or treating. 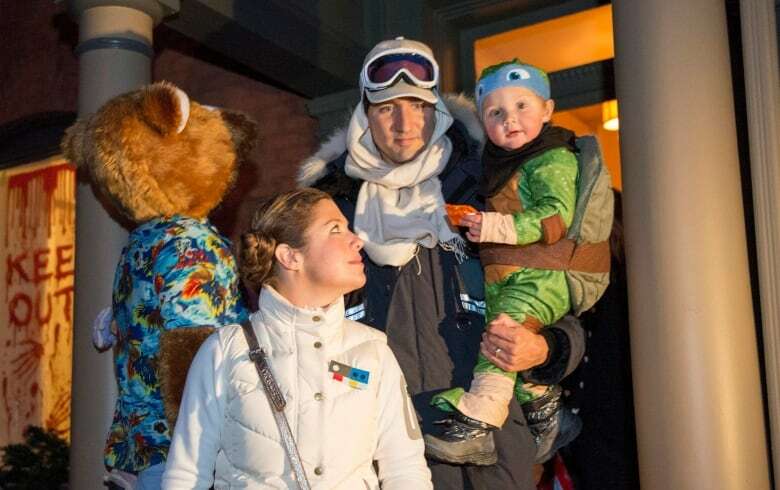 Canada's next prime minister dressed up as Han Solo of Star Wars fame while Sophie Gregoire wore a Princess Leia costume as they took their three children to knock on doors in Ottawa's high-end Rockcliffe neighbourhood Saturday night. The Trudeaus and some family friends made the rounds near Rideau Hall, the official residence of the Governor General. The Trudeaus stood on the street as their two eldest kids knocked on doors and received treats. Son Xavier, 8, was dressed as a bird, daughter Ella-Grace, 6, was dressed as Princess Anna from the Disney movie Frozen and Trudeau's 19-month-old son Hadrien was dressed as a ninja turtle. The mood was relaxed as many residents welcomed the Trudeaus to the neighbourhood and one person posed for a selfie with the incoming prime minister. One man who encountered Trudeau's party on the street didn't initially realize the Star Wars character was the prime minister designate and did a double take when he realized who it was. Security accompanying the Trudeaus was very low key. The Trudeaus will move into a home on the grounds of Rideau Hall while the prime minister's official residence 24 Sussex Drive is being renovated.